died while he was still very young.It was only in his teenage years that he first encountered Europeans, when Jeremy Long's Welfare Branch patrol came upon his family camped by a desert waterhole. In 1960s Gorge relocated to Papunya, an Aboriginal settlement several hours from Alice Springs in Central Australia. He also met and married his wife, the somewhat formidable Nangawarra Ward Napurrula (the daughter of Charlie Ward Tjakamarra), a member of one of the desert's most dominant families. They have two children. Once their first child was born, the couple moved west to Warburton, then on through the ranges to Docker River and to Warakurna. In 1981 George and his family moved to the newly established Pintupi capital of Walungurru (Kintore) which is across the NT border, in the looming shadow of Mount Leisler, where they still spend time today. George observed the work of his brothers Yala Yala and Willy Tjungurrayi, who were among Papunya's Tula's leading artists in Walungurru. In 1984 George Ward first painted on canvas: a handful of elegantly "classical" concentric roundel works from that time survive. After the death of his brother, Yala Yala in 1998, the responsibility to paint fell squarely on Ward's shoulders. By this stage, he was a senior desert man: He lived deep in the world of law. He began to paint in earnest, developing his own distinct style. The canvases he began producing for Alice Springs-based Papunya Tula artists were like nothing else that had come before in the desert art movement: sombre, cerebral, full of grave intellect. The big lake site of Kaakuratintja (Lake Macdonald), which a large group of Tingari men travelled through on their way east, is often the subject of his paintings. His meticulous geometric drawing is often offset by more rapid, shaking dotting to produce a shimmering surface. In 2004 George won the prestigious 2004 Wynne Prize at the Art Gallery of New South Wales. George has also exhibited in many galleries throughout the past decade. Now he has become one of the nation's most admired and most keenly collected artists. 2004, “Wynne Prize Exhibition”, Art Gallery of New South Wales, Sydney. 2001, “Art of the Pintupi”, Adelaide. 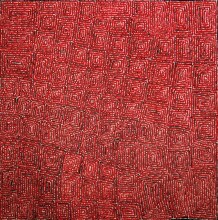 2001, “Kintore and Kiwirrkurra”, Gallery Gabrielle Pizzi, Melbourne. 2001, “Palm Beach Art Fair”, Palm Beach, Florida, USA. 2000, “Pintupi Men”, Papunya Tula Artists, Alice Springs. 2000, “Papunya Tula: Genesis and Genius”, Art Gallery of New South Wales, Sydney. 2000, “Art of the Aborigines”, Leverkusen, Germany. 1999, Araluen Arts Centre, Alice Springs. 1999, “Aboriginal Art”, IHK Worzburg, Germany. 1998, “Desert Mob Show”, Araluen Arts Centre, Alice Springs. 1998, Gallery Gabrielle Pizzi, Melbourne. 1997, Gallery Gabrielle Pizzi, Melbourne. 1997, Geschichtenbilder, Aboriginal Art Galerie Bohr, Speyer, Germany. 1997, Papunya Tula Artists, Alice Springs. 1996, Araluen Arts Centre, Alice Springs. 1996, “Adelaide Fringe Festival” Papunya Tulal Artists, Adelaide. 1996, Gallery Gabrielle Pizzi, Melbourne. 1996, Museum and Art Gallery of the Northern Territory, Darwin. 1996, “Nangara. The Australian Aboriginal Art Exhibition”, Brugge, Belgium. 1996, Papunya Tula Artists, Alice Springs. 1995, Araluen Arts Centre, Alice Springs. 1995, “Dreamings – Tjukurrpa”, Groninger Museum, The Netherlands. 1995, Museum and Art Gallery of the Northern Territory, Darwin. 1995, Papunya Tula Artists, Alice Springs. 1990, “Friendly Country – Friendly People”, Araluen Arts Centre, Alice Springs. 2004, “First Prize”, Wynne Art Award, Art Gallery of New South Wales, Sydney. Robert Holmes a Court Collection. Supreme Court of the Northern Territory. SOURCE: Birnberg, M. & Kreczmanski, J.B. (2004) Aboriginal Artists Dictionary of Biographies. Central Desert, Western Desert and Kimberley Region. JB Publishing Australia. Marleston, South Australia.